BRIGHTON, Mich - When it comes to Halloween, Livingston County sure knows how to have a great time! If you've already made your favorite fall recipes and decorated your pumpkins in preparation for the 31st, then there is nothing left to do but make your plans to CELEBRATE! These next two weekends are packed with many different Halloween events around town and we are positive that no matter where you may live that there is something happening right outside your door! Monster Splash from 6-8:30pm at the Howell Area Aquatic Center. Enjoy non-swim activities like a cupcake graveyard, fortune teller and a kid-friendly haunted sunken ship. There will be swimming competitions like swim races, a walk-the-plank cannonball contest and diving for pirate's lost gold. Registration is $4/child or $5 on the day of the event. Classic Halloween films at Brighton Arts Culture and History Center. The Brighton Historical Society will host FREE showings of the black and white classic film "The Mummy" on October 24th at 7:30pm and at 1:30pm on the 25th and 26th. Registration is required due to seating limitations. Monster Mash from 2-3:30pm at Epley Park in Hartland Township. This free annual Halloween party for people and their pets includes fall refreshments, fall treats and a pet costume contest. Great Costume Parade at 10:30am at Brighton District Library. Children ages 2-5 and their caregivers can participate in a Halloween event full of crafts, songs and stories! Treat or Treat on Barnard Street from 6-8pm at Barnard Community Center in Howell. Stop by the community center for cider, donuts, and a chance to win prizes! Adult Only Halloween Party from 7:30pm to midnight at 6060 E. M-36 in Hamburg Township. There will be a DJ, dancing, costume contest and raffles! Admission is $3 and there will be a cash bar. Additional info: Call (810) 231-1811. 4th Annual Tridge-or-Treat Halloween Spooktacular from 6-8pm at the Millpond. Kids can follow a route along the tridge to collect candy from some of their favorite characters! Attendees are encourage to head to the Brighton Fire Department after this event for the annual Costume Party! 73rd Annual Brighton Area Fire Department Halloween Party from 6-9pm at the Brighton Area Fire Dept. Station 31. This FREE event will have pizza, refreshments, games, prizes, and of course...CANDY! There will also be a costume contest at 8pm. If there are other Spooktacular Halloween Events Happening Around Livingston County that you believe we should know about, please let us know! Feel free to comment in the box below with any additional event information that you may have. 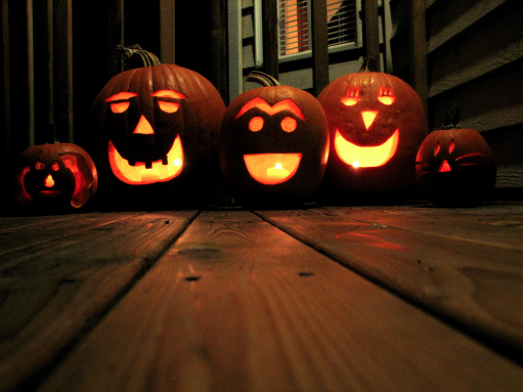 We hope everyone has safe and HAPPY HALLOWEEN! Even though it is the spookiest time of the year, we are all treats and no tricks at Brighton Ford! Stop by the dealership today to see the awesome deals we have on a variety of Ford vehicles. We are located at 8240 Grand River Ave. just north of I-96 in Brighton. We are a family owned and operated business that strives for customer satisfaction. For more information on Brighton Ford visit BrightonFord.com or give us a call at (800) 836-7417.